This eco-region comprises the countries, sovereign islands and island states of the Mediterranean Sea, including: Albania , Algeria, Bosnia and Herzegovina, Croatia, Cyprus, Egypt, France, Gaza Strip, Gibraltar, Greece, Israel, Italy, Lebanon, Libya, Malta, Monaco, Morocco, Serbia & Montenegro, Slovenia, Spain, Syria, Tunisia and Turkey. It covers 26,000 km of coastline. 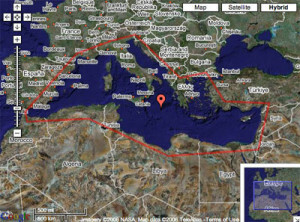 The Mediterranean is somewhat unique, in that it is almost completely land-bound, with Europe to the north, Africa to the south and Asia Minor to the east. The Black Sea is linked to the Mediterranean through the Turkish straits, but is considered a separate ecosystem. The major inflow into the Mediterranean is nutrient-poor, oxygenated Atlantic surface water through the Strait of Gibraltar, resulting in generally well-oxygenated but nutrient-poor bottom waters. Freshwater inflows are relatively low with the exception of areas of local enrichment, such as the river estuaries, coastal waters receiving terrestrial run-off, and where sewage is discharged into the sea, primary production is low. For this reason there is very little plankton in the Mediterranean, resulting in the characteristic transparency and blue colour of the sea. The Mediterranean Sea is in essence a large basin, separated from the Atlantic Ocean by a 320m deep sill at the Strait of Gibraltar. It contains a narrow shelf, with wider shelves and has an average depth of approximately 1500m. The large basin is made up of a number of smaller basins, with tides generally of low amplitude, for example only 0.06m around Malta. Rocky reefs, seagrass meadows and upwelling areas are particularly important habitats for Mediterranean marine biodiversity. Seagrass meadows are an important habitat for numerous marine species, particularly fish, crustaceans, and marine turtles, providing breeding, feeding, and resting areas. These meadows produce more than 80 per cent of the annual fish yield in the Mediterranean. The grasses also stabilize the seashore and maintain water quality, particularly through oxygen production. The rocky reef ecosystems provide habitat for the endangered monk seal (Monachus monachus), and several endemic fish and invertebrates. The monk seal is the most endangered pinniped species worldwide and is currently on the brink of extinction Although formerly found all over the Mediterranean Sea, Black Sea and northwest African coast, the species’ numbers have now been reduced to perhaps less than 400. This unusual sea is biologically distinctive from the adjacent Atlantic Ocean, with significant endemism over a range of marine fauna. Important species include the endangered monk seal of course; Mediterranean mussel (Mytilus galloprovincialis), mullets (Mugilidae), gilthead sea bream (Sparus aurata), sea bass (Dicentrarchus labrax), dolphins (Stenella coeruleoalba), fin whale (Balaenoptera physalus), harbor porpoise (Phocoena phocoena) and several species of dolphins. General threats to this eco-region are legion and include coastal development, intensive tourism and land reclamation for agriculture place pressures on key wildlife habitats. Local and regional problems created by pollution arising from domestic and industrial effluent, oil transportation and refineries, and agricultural run-off, are beginning to have an impact on wildlife as well as on human populations and fisheries. Ten species of sea grass in the region are now considered endangered by intense development, urbanization, and the release of untreated sewage into the sea.